In today’s aggressive professional environment, an advanced degree gives individuals a competitive edge as they boast enhanced leadership preparation, applied skills, and proven excitement for continuous learning and discovery. Approximately 370 prospective students received information on Southern Illinois University Edwardsville’s more than 100 master’s programs, post-baccalaureate certificates, specialist degrees, doctoral degrees and cooperative doctoral programs during the Graduate School Open House held Wednesday, Oct. 18 on campus. “There are multiple advantages to pursuing an advanced degree at SIUE, including our supportive learning environment, rich intellectual experiences, access to distinguished faculty and specialized research centers, and notable growth in external funding for research and creative activities,” said Jerry Weinberg, PhD, associate provost for research and dean of the SIUE Graduate School. At the Open House, prospective students learned more about admissions requirements and financial support, including graduate assistantships and competitive graduate awards. During the event’s two sessions, approximately 365 individuals applied for graduate school. Open House attendees had the opportunity to speak with representatives from each of the graduate programs in the College of Arts and Sciences, and Schools of Nursing, Business, Pharmacy, Engineering, and Education, Health and Human Behavior. The spring Graduate Admissions Open House will be held April 11, 2018. For more information on pursuing a graduate degree at SIUE call 618-650-2741 or email graduateadmissions@siue.edu. 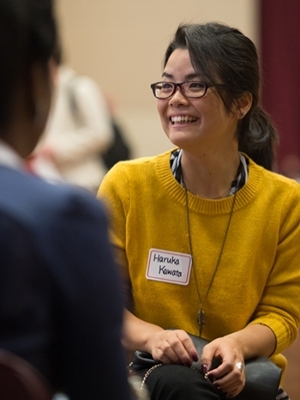 Photos: Haruka Kawata attended the SIUE Graduate School Open House to learn more about the art therapy counseling program and gain the perspective of current graduate students. 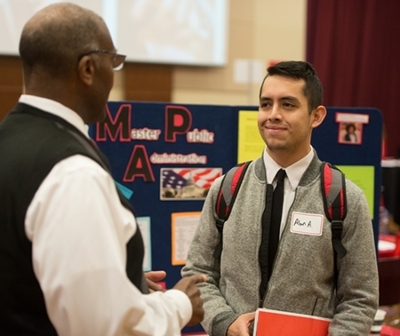 Alan Ayala, of Springfield, met with Morris Taylor, PhD, associate professor and chair of the public administration and policy analysis program, during SIUE’s Graduate School Open House.